DIY Icosahedron Mobile/Toy Made From Colored Pencils! It’s never too early to instill a little pragmatism into your children, but it’s always best when done with a little bit of creativity. 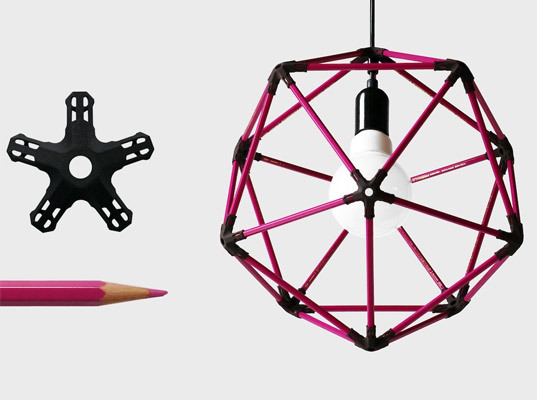 Spotted by our intrepid reporters at this year’s Model Citizens show, designer Michiel Cornelissen’s ‘30 Pencil Icosahedron’ is a new take on childhood construction toys that allows kids to create a complex icosahedron from a set of 30 standard pencils. Let them hang it up as an amazing lampshade or simply toss it around as a fun educational tool — this new hands-on design is sure to keep your kids’ minds busy and bright. It’s never too early to instill a little pragmatism into your children, but it’s always best when done with a little bit of creativity. Spotted by our intrepid reporters at this year's Model Citizens show, designer Michiel Cornelissen’s ‘30 Pencil Icosahedron’ is a new take on childhood construction toys that allows kids to create a complex icosahedron from a set of 30 standard pencils. Let them hang it up as an amazing lampshade or simply toss it around as a fun educational tool -- this new hands-on design is sure to keep your kids' minds busy and bright.